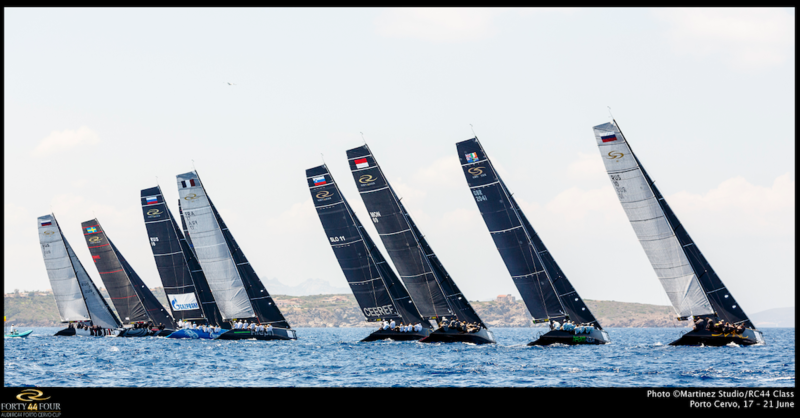 Revolution Switzerland had the immense pleasure of attending the Audi RC44 Porto Cervo Cup in Sardinia as the lucky guest of HYT, Official Timekeeper of this year’s RC44 Championship Tour. Created by five-times America’s Cup winner Russell Coutts, the RC44 Championship Tour has become a key competition in the international regatta scene ever since its foundation in 2007, bringing together passionate amateur yachtsmen and many of the world’s top sailors who race onboard identical yachts in five breathtaking venues around the globe. For a brand that prides itself on combining liquids with mechanics, no partnership seems more perfect than one that involves water. We were honored to join the HYT team in Porto Cervo as they celebrated their very first sports partnership and the launch of a special H1 timepiece to mark the occasion. The latest H1 Air RC44 is part of a new collection called the H1 Air, comprising three limited edition watches. 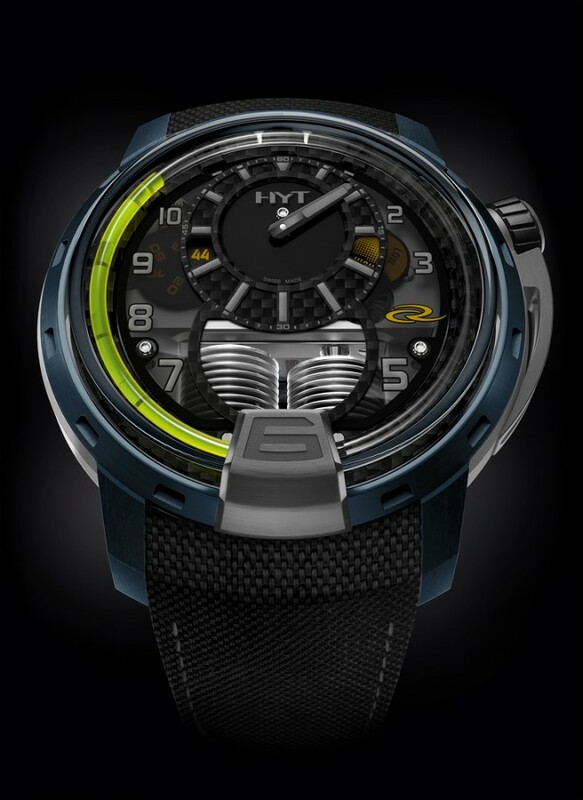 This celebratory timepiece is the first HYT has ever created as part of a partnership. Paying tribute to the Championship, the H1 Air RC44 combines HYT’s fluid technology with details that recall the lightness and high-performance of the RC44 yachts. Co-designed by Coutts and Slovenian yacht designer Andrej Justin, the RC44 yachts are entirely made out of carbon fiber — from the keel to the tip of the mast. Highly resistant and lightweight, carbon fiber renders the yachts incredibly light, allowing them to perform just as exceptionally in calm breezes and heavier winds. 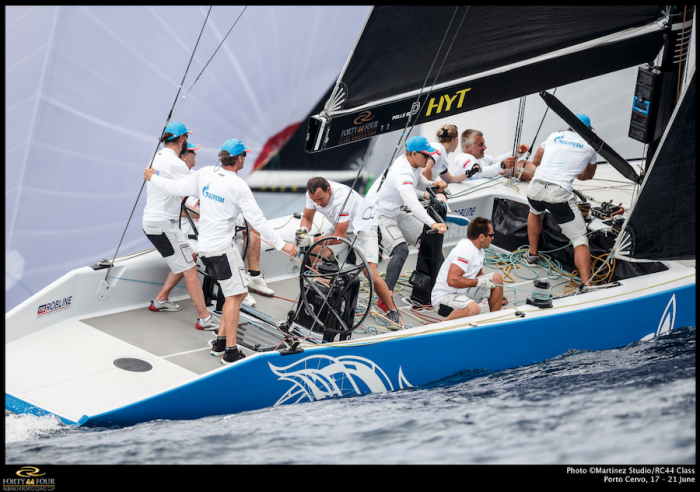 Similarly, the H1 Air RC44 features an applied chapter ring made out of a single piece of carbon. The case is crafted out of blue Alun 316b, a type of aluminium composite, rendering the watch ultra-light and modern. Other details evoke the regatta, such as a yellow “44” represented on the minutes sub-dial as well as the championship’s logo portrayed at four o’ clock. Limited to 22 pieces, the H1 Air RC44 introduces the use of a smoked sapphire crystal dial for the first time at HYT. The smoked sapphire crystal dial offers a clear view of the movement powering the watch, with an opening at six o’ clock displaying HYT’s signature bellows. The H1 Air RC44 features yellow fluid rotating around the dial to indicate the hours in a retrograde manner and a central sub-dial to portray the minutes. A seconds disc and power reserve indicator complete the dial design, shown at nine and three o’ clock respectively. “This play on light and shadows is the common denominator in all three Air pieces,” shares Vincent Perriard, HYT CEO. “These new H1s are designed in stratum, firstly with the movement, then the sapphire dial and then finally the applied chapter. 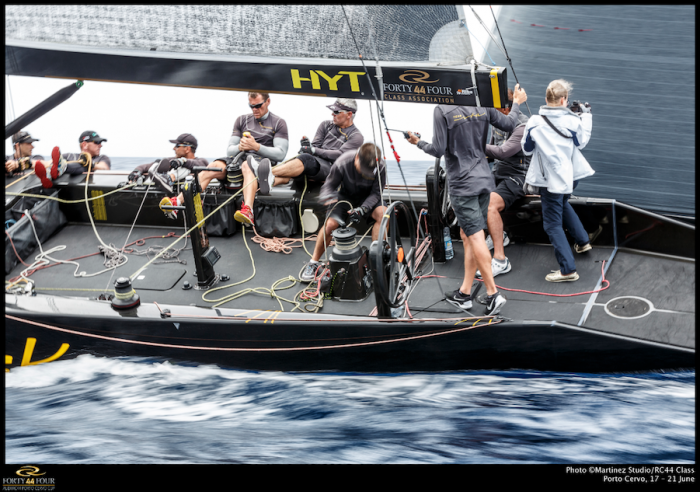 Playing with these different levels allowed us to integrate new depths and a different volume and richness to the pieces.” Stay tuned to Revolution Switzerland‘s September issue for a full report on the H1 Air RC44 and HYT’s partnership with the RC44 Championship Tour!